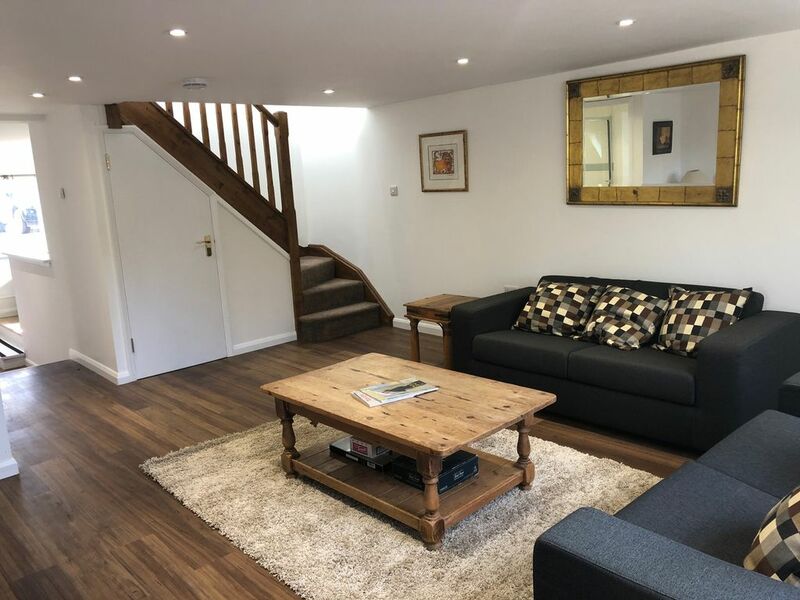 The cottage is newly finished in 2018 and décor is fresh and modern with plenty of parking and a small decking area. This is a quiet cottage . Rooms are light and spacious with a modern kitchen/dining room that provides for sociable cooking and dining (seats 4-6). and patio doors that open onto the garden. The reception room is separate, both with digital TV (so the kids can escape!) and good but limited wifi. No fibre cable out here . Efficient central heating means the house is warm in winter but its also well ventilated and cool in summer.There is an upstairs loo and bathroom with large shower downstairs. 2 bedrooms are available; one double- bedded and 2 singles and there is also a brand new double sofa bed in the lounge. The small patio is secluded, fully fenced, and child/pet friendly and great for drinks on a summer evening: count how many species of bird you can hear !. The darkness allows you to watch an impressive array stars on a clear evening and the quiet off street location means a peaceful night's sleep is guaranteed. Please note we have a cat and small dog so any pets must be under your control outside. We really loved our stay. A lovely little retreat, plenty of room, beautiful settings. Very handy for Lewes and Brighton. Owner Eugene popped in to say hello soon after we arrived which was a nice friendly welcome. Dog Molly and cat Alfie wandered in briefly which was sweet. The train did run past every 25mins or so but actually not very noisy. Nice property, well located for our visit to Charleston farmhouse, Lovely walking on the doorstep. The house was large with nice furniture, upstairs the roof was on a steep angle, so you can’t walk upstraight. When you arrive and read the book with instructions there was a list with a lot of do’s en mostly dont’s. It was a bit overwhelming and it does not feel welcome.Wifi is limited. We were not satisfied about the cleaning of the house. You can hardly hear the trains. But in total it was a nice stay. I am glad the guest enjoyed their stay. I am sorry the guest found the two hours cleaning done before their arrival was not up to their standard. Interestingly my cleaner had to spend an hour more cleaning up after they left than for any other guest we have ever had.such was the mess. That we found amusing. Also I am sorry they found our list of house considerations onerous. It is done to prevent things like the huge scratches they left in the surface of the induction hob. Lucky they didn’t get a replacement bill. Never mind I am sure they’re lovely people really. Delightful house in rural area, trains do go by but they are really quiet. Great house for a rural retreat. Good position for Lewes, Glyndeborne, Brighton, Hove and such wonderful walks. Lewes is a delight. The location was perfect for exploring the Sussex countryside and coastline with Lewes close by for shopping. The property was very clean and newly decorated with much thought put into it. But i would add that the bedrooms are in the eaves which makes getting into bed in the main bedroom awkward. There is also a train line running 20metres from the property which starts about 5am. It is not particularly noisy but could distrub some especially in the summer if you have the windows open. That said, the birdsong everywhere more than made up for it.